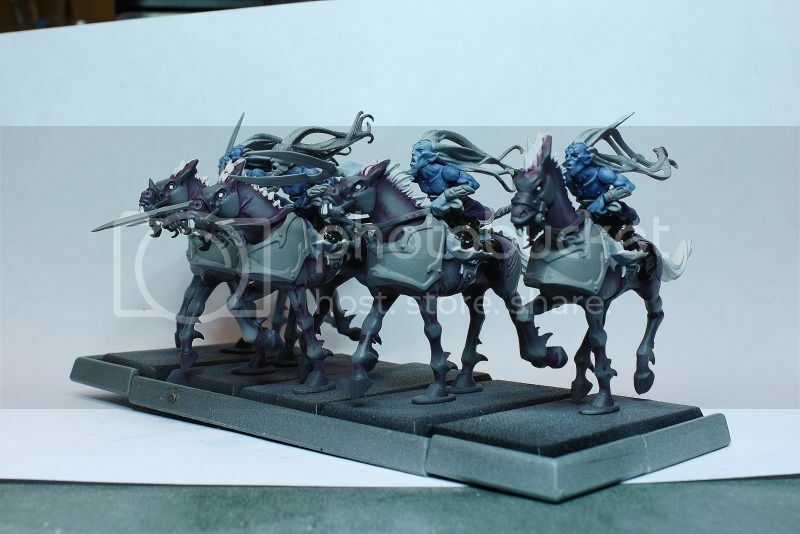 - Basecoat the skin on the warlocks riders. But before getting ahead of myself, lets see what i accomplished. 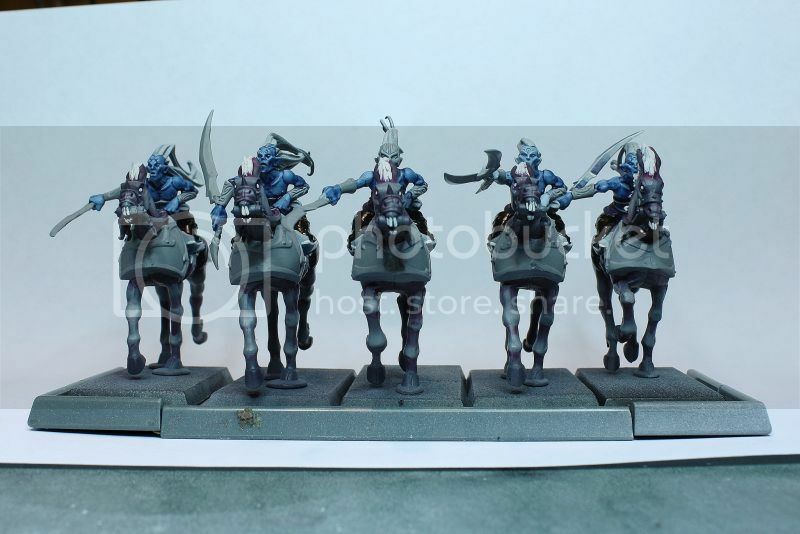 5 of the warlocks as they stand right now. Side shots of the same 5. 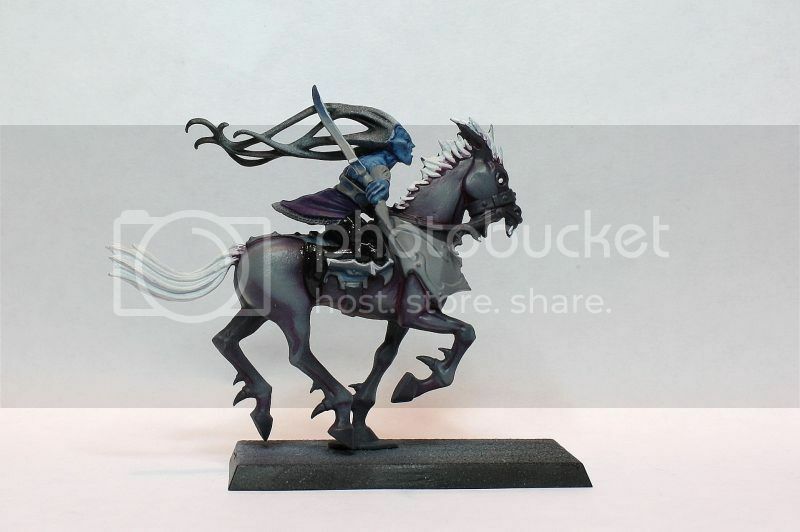 Have to say, when i started painting the horse, i didnt consider how they'd look with a "blueish" rider on them... now that its half painted, i have second though. Might dissapear once i start highlighting the skin and they don't look like smurf riding on purple horse from "my little poney"..
On this one, i went a little further and started working on the metal on the weapon, to see how it' would look. So much more fun to paint large weapon like that instead of little dagger like witches, i actually enjoyed painting them. looking forward to doing the rest. - Finish Skin. There's about 4 layer to add before i can call it finished. Right now, its only basecoated and washed. - Paint weapons. Gonna be easy, and fun! those weapon actually made me look forward to paint my 20-30 Executionners. - Pain the hair. Gonna be white, like the rest, but i'm thinking about adding more pinkish hue to it... i did add a bit of purple to the base of the horse hair, and i liked it, so i think i'll add that small tint to the rest of my model to divide the hair from the face/crown/whatever. - Paint the hoof! look simple enough, but for some reason, not looking forward to it... a simple black might be too boring... i'll need to think it through. - Figure out a color for the little chainmail line under the trouser. No clue what color to paint it... i tried white on a few of them, kinda make it look like fur... could work. Looking at all that is left to paint, not sure i can achieve it in a week... But time is running out.